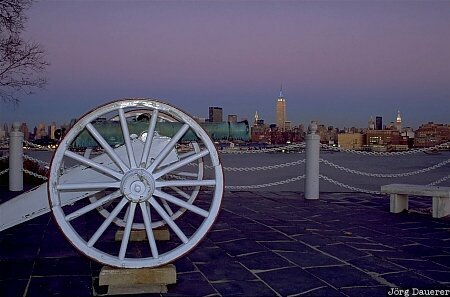 Skyline of Manhattan with the illuminated Empire State Building seen from the Cannon at the campus of Stevens Institute of Technology in Hoboken, New Jersey. Manhattan is in New York City, New York on the east coast of the United States. This photo was taken in the late afternoon of a sunny day in November of 1997.